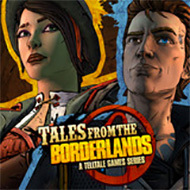 It’s been a while since we saw an episode of Tales from the Borderlands, and Telltale knows it. Heck, when the game starts up, the first thing out of Marcus’s mouth is, “It’s been a long time,” before he shrugs off the complaint. This simple line sets the whole tone for the rest of the episode, a spectacular and genuinely funny bout of self-aware game design. Tales from the Borderlands Episode 2 doesn’t take anything seriously, not itself, not Telltale games, not you, the player, nothing, and it’s because of this “nothing is sacred” attitude that this episode is so much fun to play. Picking up where the last episode left off, Rhys and Fiona had just uncovered their first bits of info about the Gortys project. Just what it is, we still aren’t sure. What we do know is that everyone on Pandora wants a piece of it, and Rhys and Fiona may have the only way to access it. This brings down their many enemies, from Rhys’s crappy boss to all the people Fiona has fleeced in the past, right on their heads. The “heist gone wrong” theme from Episode 1 continues, as both characters recount their story to their mysterious captor, still trying to out “big fish” each other, and still correcting each other at every turn. Tales from the Borderlands Episode 2 is at its best when it’s actively making fun of itself. Early on, when you have to make an important story decision, Rhys starts talking to himself, saying, “this seems like it will be a big DESCISION to make. I don’t usually talk to myself when I have to make big CHOICES, but you should probably CHOOSE WHERE WE GO NEXT,” highlighting the frequently used Telltale trope. The reminder text even jokes around, straying away from the standard, “he or she will remember that” and instead commenting on your personality and general lack of good decision making skills. The game makes references to memes we all know, like ceiling cat, tears down bro culture, and even makes fun of the Borderlands loot formula. It points out all the hilarious and weird things that we constantly see in video games, and that’s always good for a chuckle. 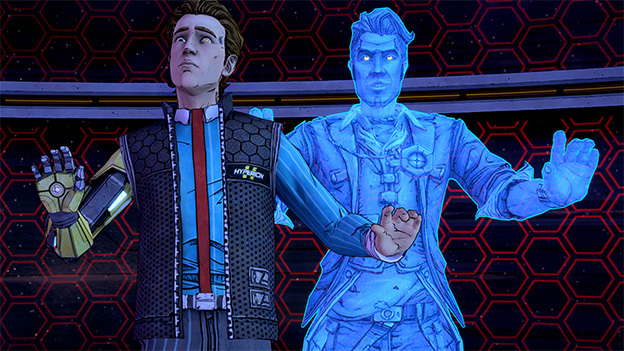 Speaking of funny, one of the best devices that Episode 2 has for bringing home the humor, is the one, the only, Handsome Jack… or at least the holographic version of him. This villain that everybody loves to hate, who showed up at the end of the last episode, plays a much more prominent role in this episode, and he is as charismatic as ever. 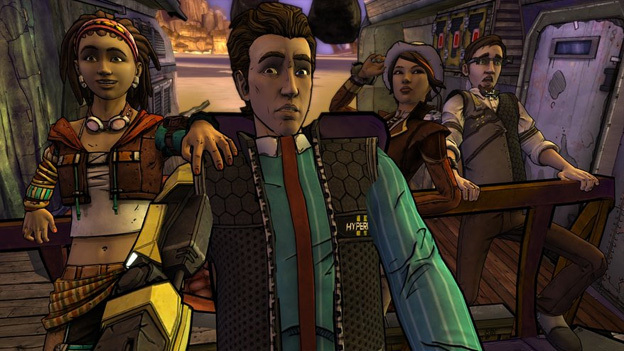 Between randomly quipping about killing people, giving Rhys “helpful” advice, and generally playing the role of the voice inside the player’s mind, Jack continues to be funny every time he speaks. There are lots of other things that this episode mocks. For one, it mocks basically everything you have seen in Borderlands 2. You’ll find yourself scrolling through loot menu for rare skins with stats that barely make any sense, and sifting through loot bins looking to scrape up cash and guns. You’ll watch people pose awkwardly for their introduction splash screens, looking at a camera that isn’t there. You’ll run into references to Torgue, explosions, and well, more explosions because this is Torgue we are talking about. You’ll even run into our old pal Scooter - same voice actor, same inbred personality. It’s actually these references to the other events of the Borderlands franchise that make the game a treat to play even when it isn’t making fun of itself. It loves to entice you with plot elements that tie Borderlands 1, Borderlands 2, and Borderlands The Pre-Sequel together, all leading up to Borderlands 3. We get to see Athena, for example, and she was the main narrator of Borderlands: The Pre-Sequel. Scooter says he is turning his Catch-A-Ride station into a franchise, and selling the original to Janey Springs, one of the first characters that aided us in The Pre-Sequel, who also makes an appearance in this episode. Each and every tiny piece of the puzzle brings you closer to understanding more about the Borderlands universe, which is way deeper than you once thought.